3rd October 1997 - 'Half Hearted and unsuccessful' chase. Chasing during family holidays is always a limited option. I was fortunate that my wife was happy to hit the shops for several hours and had left me to do whatever I want. We were holidaying at the Blue Mountains about 2 hours west of Sydney. During the early hours of Friday morning ( 3rd Oct ) there were two separate storms that brought brief heavy rain. Daylight however was not promising. A cool north west wind had developed, this wind back in my local area is a death sentence for any activity. I presumed things would pan out similar here and gave up chasing storms as a possibility. At around 1pm I was checking out the Mount Tomah Botanical gardens, the wind had risen to gale force from the north west, again I had given up all thoughts of storms. Around 2.30pm I was very surprised to see that an isolated cell had formed rapidly to the west. I immediately hit the road to intercept it. This was only a small cell but it did show some promise, but quickly moved east over the Wollemi National park. I pulled over at the small village of Mount Wilson to get a better picture of any other potential storms. The car radio was tuned to the ABC ( Australian Broadcasting Company ) the only station here in Australia that bothers to broadcast the weather bureau's severe thunderstorm advice's / warnings. I was surprised when I heard that a severe storm advice had gone up for the Central West Slopes and Central Tablelands in a line east and north of the Mitchell Hwy. Unfortunately I was at least 2-3 hours from that area. 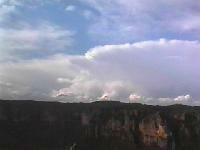 The cell I had first noticed had by now moved over remote parts of the Wollemi National park. There are no roads in this hundreds of square miles of area. Which is unfortunate as activity did move up a few notches. 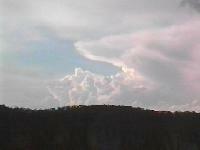 The best I was able to do was take the above pictures of the rapidly growing ( and moving ) storms. It was mentioned on TV that night that some of these storms had been ' briefly severe '.